Since the Porcine Epidemic Diarrhea virus (PEDv) entered Ontario on January 22, 2014, the Ontario Pork Industry has been working together to help manage this disease. Positive cases have been limited to 87 cases. Good biosecurity practices, increased vigilance and strong clean-up efforts have resulted in limiting the spread of the disease. Although it’s that cold and snowy time of year, don’t let your biosecurity guard down. Be vigilant and keep your herd protected and healthy! If you suspect that your pigs may be infected with PED virus, contact your veterinarian immediately. He or she will provide strategies to help you to manage the disease. Be vigilant and watch for early signs of scouring. Animal Health Lab Submission Forms for PED. Biosecurity procedures need to become routine business practices. Implementing strict on-farm biosecurity protocols can prevent PED from infecting your pigs. Proper biosecurity measures should include protocols that address animal, supply and personnel movements. Take some time to read through your procedures, ensuring they are correct and in place. Then take the time to review the policies and procedures with staff, highlighting the importance of biosecurity for your herd. Biosecurity Fundamentals For Visitors To Livestock Facilities identifies measures to follow. PED virus is highly infectious and can be easily spread to farms through contaminated trailers. You should ensure that only washed and disinfected trailers come on to your farm to pick up or deliver live animals. Ontario’s Worst Weeds – have your say! What are Ontario’s Worst Weeds???? Your input will help decide. Results of this survey will highlight weed trends and concerns in Ontario. Your participation is appreciated. Source: Ontario’s Worst Weeds – have your say! “The revised Canadian Organic Standards were released Wednesday, November 25, 2015. To prepare Canadians for the changes, COG is offering a series of webinars on the changes called Changes to The Canadian Organic Standards – An Essential Update. These webinars were [originally] presented in the fall and highlighted important changes in the standards and allowed producers, certifiers and verification officers, among others, to ask questions and fully understand the revisions before they come into effect later this month. Preparation including Processing: Tuesday, February 9, 7 PM Eastern Register here. Recent barn fires in Ontario remind us how important it is to check for fire hazards in our barns. OMAFRA Publication 837 REDUCING THE RISK OF FIRE ON YOUR FARM discusses leading causes of barn fires, ways to prevent fires and things you can do to reduce the impact of barn fires for all species of livestock. 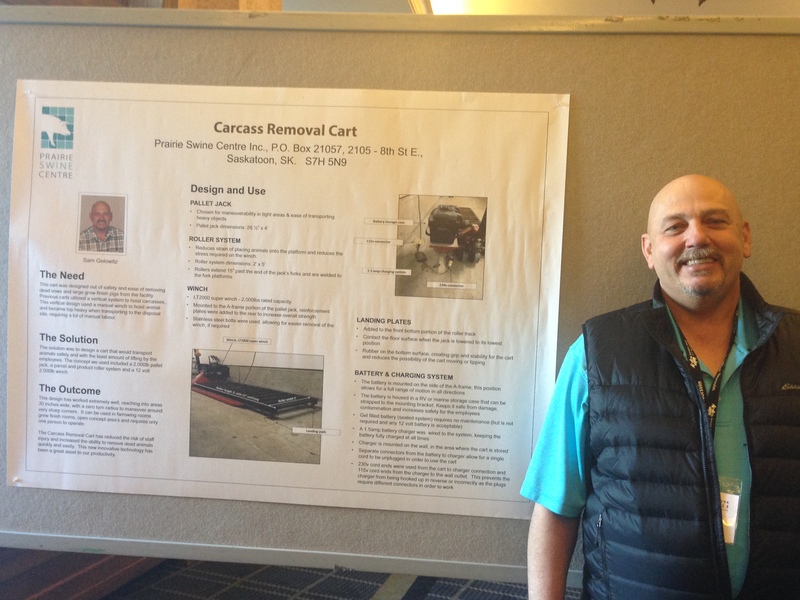 This year the F. X. Aherne Prize for Innovative Pork Production at the Banff Pork Seminar was shared by two winners; Steve’s Livestock for their innovations around hydraulic livestock trailers, and Sam Gelowitz from the Prairie Swine Centre for a Carcass Removal Cart. Information about both winners will be posted on the Banff Pork Seminar website (www.banffpork.ca). The carcass removal cart was designed with worker safety in mind. Previous deadstock carts utilized a vertical system to hoist carcasses, which becomes difficult and dangerous for barn workers. These carts usually require more than one staff member, and often become top heavy once a large market pig, sow or boar are loaded. Sam Gelowitz, Maintenance Manager at the Prairie Swine Centre, recognized the need for a safer, easier to use system. His solution was to design a cart that could transport carcasses safely, and with the least amount of manual labour as possible. His design uses a 2000 lb capacity pallet jack, a simple roller system (used by many industries) and a 12 volt, 2000 lb winch. This design is 26.5 inches wide, and 5 feet long, and has a zero turn radius, allowing it to get into tight corners (such as behind farrowing crates). The roller system is welded onto the pallet jack, with the winch attached at the front to easily pull carcasses up onto the rollers. The design of the cart has worked extremely well for the Prairie Swine Centre. The cart has reduced the risk of staff injury and increased the ability to remove dead animals quickly and easily, with fewer staff needed for the job.